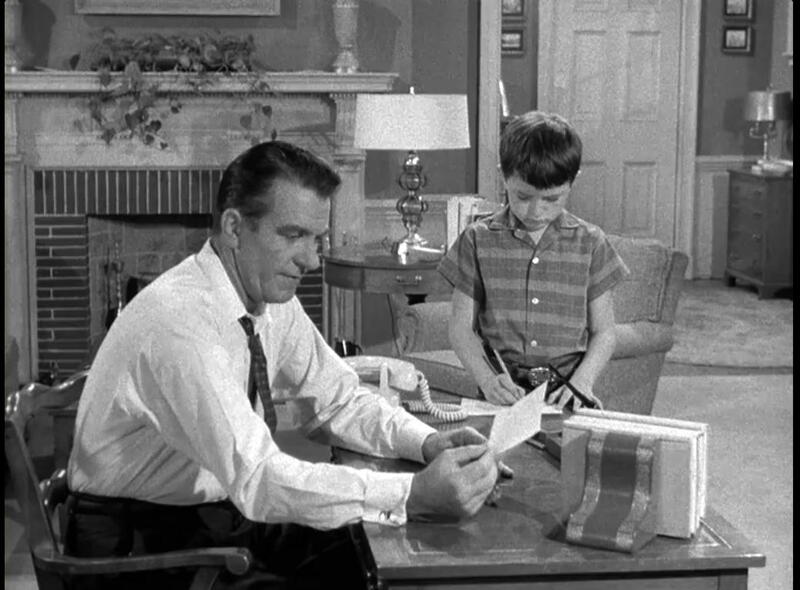 This post has nothing to do with silent movies (these posts connecting Beaver to Long Beach and to Santa Monica do), but I’ve really been enjoying watching Leave it to Beaver on Netflix instant streaming. 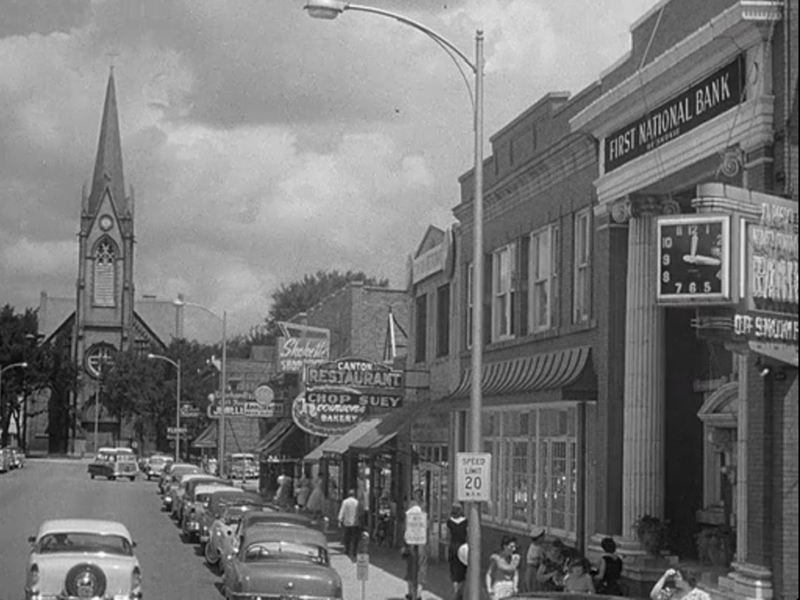 When they showed this idyllic small town main street during a scene from “Beaver’s Fortune” (Season 3:Episode 10; first broadcast December 5, 1959), I had to hit the freeze frame to figure it out. Although Beaver takes place in “Mayfield,” set in an undetermined state that must have “Springfield” (the rootless home town featured in The Simpsons) for its neighbor, it turns out Skokie, Illinois appears during this stock footage shot (no actors from the show appear in this scene). 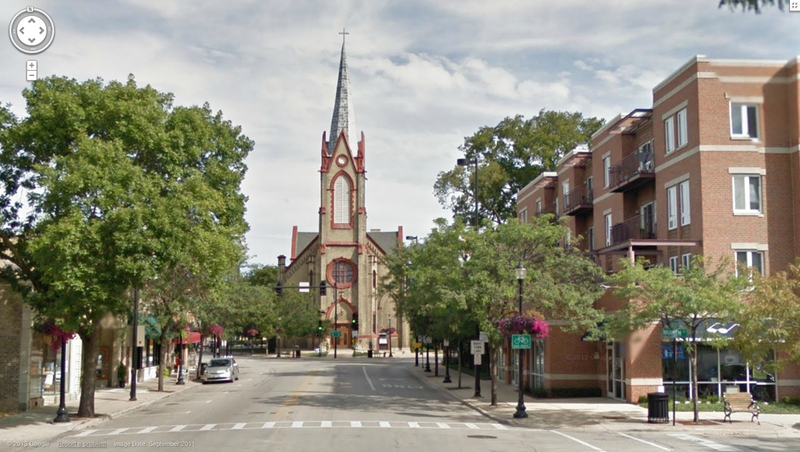 The view looks north up Lincoln Avenue from Oakton Street towards St. Peter’s Catholic Church, originally built in 1894. I was able to solve this easily enough, because even though Beaver was first broadcast over the airwaves in decidedly low-tech, low resolution, it was shot on 35mm “HD” film stock. I sensed a word on the bank sign said “Skokie,” and was proven right. North up Lincoln at Warren Street, Skokie Illinois – (C) 2013 Google Inc.
It’s sad to see that the east side of Lincoln Avenue appearing during the scene has been replaced by a 1980s era bank plaza and related commercial buildings. The west side of Lincoln, appearing off camera, is relatively unchanged. Watching a prior episode “Her Idol” (Season 2: Episode 6; first broadcast November 6, 1958), I nearly fell out of my chair when I noticed I was able to read this letter sent home from Beaver’s grade school principal. 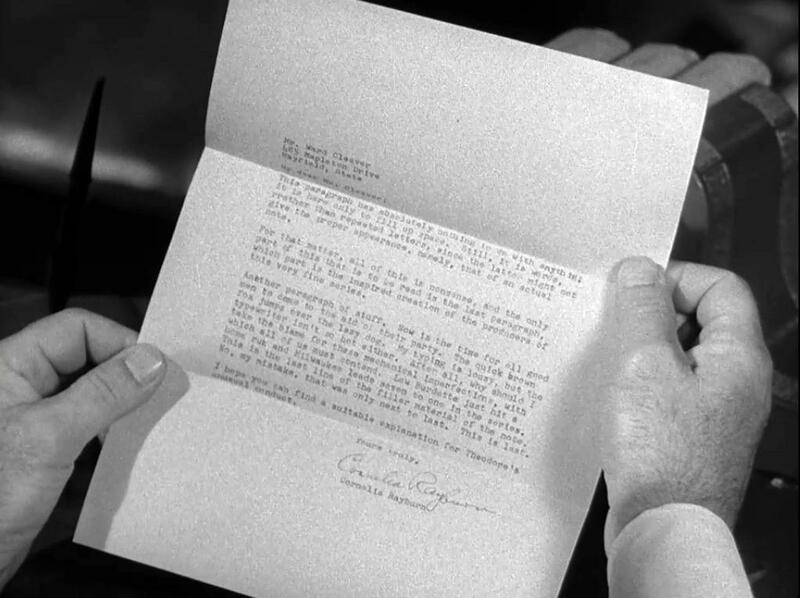 The person responsible for creating the prop letter obviously relied on the fact that the letter would appear only briefly on camera, in low resolution, without realizing that decades later technological advances would provide bored viewers such as myself the ability to scrutinize his handiwork. The full text of this letter appears below. This paragraph has absolutely nothing to do with anything. It is here merely to fill up space. Still, it is words, rather than repeated letters, since the latter might not give the proper appearance, namely, that of an actual note. For that matter, all of this is nonsense, and the only part of this that is to be read is the last paragraph, which part is the inspired creation of the producers of this very fine series. Another paragraph of stuff. Now is the time for all good men to come to the aid of their party. The quick brown fox jumps over the lazy dog. My typing is lousy, but the typewriter isn’t so hot either. After all, why should I take the blame for these mechanical imperfections, with which all of us must contend. Lew Burdette just hit a home run and Milwaukee leads seven to one in the series. This is the last line of the filler material of the note. No, my mistake, that was only the next to last. This is last. I hope you can find a suitable explanation for Theodore’s unusual conduct. Well, after decoding this secret message, I felt pretty smug, but not being able to leave well enough alone, it crossed my mind to Google the text I had just deciphered, and low and behold, the Curious Case of the Beaver Letter had already been properly explored, long ago, at one of my favorite websites, Shorpy.com, “History in HD,” a site that posts fascinating high resolution vintage photographs. It turns out the reference to Lew Burdette ties the letter to Game 2 of the World Series between the Yankees and the Braves, played October 2, 1958, about a month before the episode aired. Here’s the link to the Shorpy treatment of Beaver’s letter. It makes me wonder what other Easter eggs from early television lie waiting to be discovered. Leave it to Beaver – (C) 1958 Gomalco Productions, Inc.; (C) 1959 Revue Productions, Inc. This entry was posted in Leave It To Beaver, TV Shows and tagged Leave it to Beaver, Shorpy, Skokie. Bookmark the permalink. Just a quick note to clear up any possible confusion about “HD” 35mm film. High Definition projects can be created a couple of ways: they are either originally shot using high definition technology (for example, the RED camera), or, for pretty much anything shot on 35mm film before the late 1990s, the film is re-mastered to HD videotape using a High Definition (as opposed to standard definition) system called a Telecine. Sadly, HD 35mm film doesn’t exist – but it sure would have made things a lot easier it it did! In television, 35mm film was for years the comparative “standard” of resolution to strive for in video reproduction. Quad (2 inch) videotape was the first to come close. Later 1″ videotape came much closer, and as we turned the corner into digital videotape such as DVC Pro, those comparisons with 35mm film were finally dropped, as we were not only “there”, but were surpassing the resolution of the film medium with the onslaught of HD video. And the ensuing parade of news anchors to the plastic surgeons to keep themselves wrinkle free. Thanks Joe – that is quite a coincidence! Niles East High School is featured in the 1953 short film “Mind Your Manners” http://www.youtube.com/watch?v=kNSZ5OfpQbY It shows at 6:19 … and you can read “Evanston/Northbrook” on the Glenview Bus Co sign. Very interesting about the silent films. Thanks for the YouTube link. I remember watching these films in grade school. Too funny. Niles East was also in the opening shots of “Sixteen Candles”. I had read years ago that the opening credit scenes were filmed in Evanston. Is that true and if so which street? To my eye the opening credits were filmed at the studio backlot sets of the Cleaver home. During the series they show short clips of schools and playgrounds, etc., that appear to be stock footage, that could have been taken anywhere. 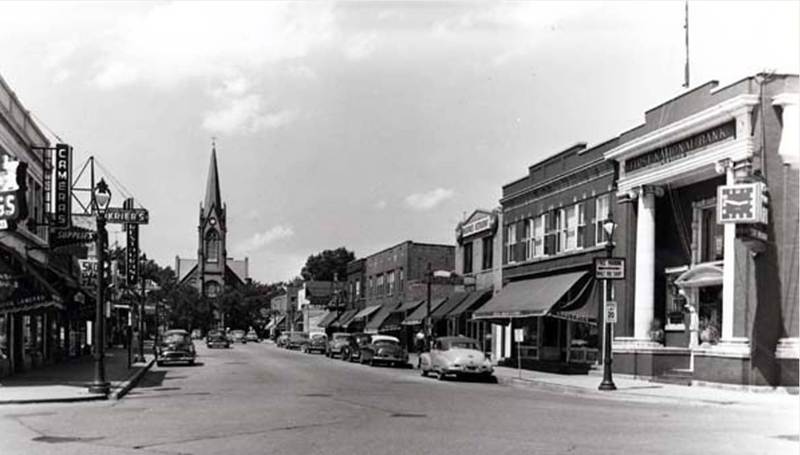 Skokie was home to alot of early movies esp the silent ones . The old Keystone cops were really living on Keystone. There was a guy at the Skokie theater named Al knew all about this.